I know that I said that I wasn’t going to sign up for many reading challenges at all this year, but I’ve found a few more that I just can’t resist. Two new challenges that will give my reading a helpful shove in the right direction, and two old favourites that I know, love and can’t possibly miss. 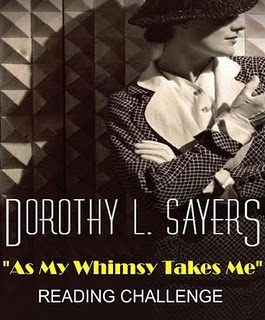 When I first read Dorothy L Sayers I picked up her books in random order, and it was only later that I realised how the series developed and grew as it progresses. I decided that I would reread all of her books in order. I gathered up copies but I hadn’t quite got started. But then Cristina at Rochester Reader decided to do the same thing and invited others to join her. Of course, I had to say yes! 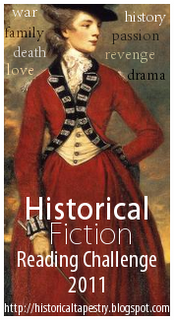 I have fallen out of the habit of reading historical fiction over the last few years, and I am realising now that I really miss it, that I really want to lose myself in stories from another age again. Lord James by Catherine Hermary-Vieille has just landed in my library pile, and My Last Duchess by Daisy Goodwin is on hold and in transit. That’s the first level for this challenge at Historical Tapestry covered, and I know that signing up will inspire me to read more wonderful books. 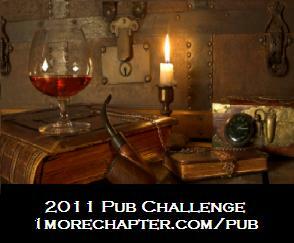 I have always loved this challenge, and I know that I can easily meet the target of reading eleven books first published in 2011. I’ve already read – and very much liked one – Darkside by Belinda Bauer. Thank you Michelle for hosting this one for another year. I have Michelle to thank for this one too. Now I don’t necessarily think of myself as a reder of award winning books, but there are many intriguing titles that I have picked up from award lists, and I have spotted many interesting books because they have the name of an award – often one that I haven’t heard of – on the cover. So five winners in 10 months sounds like a very nice propostion. I’m not going to name any books, but I’m going to have a lovely time perusing lists and picking up unfamiliar titles that I see have won awards. And I think that’s plenty to keep me busy and happy – at least for now! One of my reading groups focuses on books that have won awards and given how often there have been negative comments following the announcement of prize winners we have been surprised at how often we’ve come away from our discussion saying “yes, that deserved to win.” Only once have we looked at each other in amazement and asked, “What were the judges thinking about?” I won’t tell you which book that was, though, in case you were thinking of reading it. The kinship is such a lovely aspect to reading challenges. I read books that are very different to those of my friends and colleagues and love being able to share with someone. All the best with your challenges! Oh, I’m terribly tempted by the Lord Peter and Harriet series challenge; I’ve been gradually reading them over the years — am on the 5th just now — such charming characters and great style!